PROCELL's OATS-CELL is high quality oatmeal, low in fat and no added sugars. It is only sweetened with sucralose to maximize its great flavor. Oats are considered the queen of cereals because of their high protein content, their large number of vitamins and minerals, carbohydrates, trace elements, iron, phosphorus, among other minerals, in addition to its multiple beneficial properties for our body (cancer prevention, intestinal regulation, osteoporosis improvement ...). 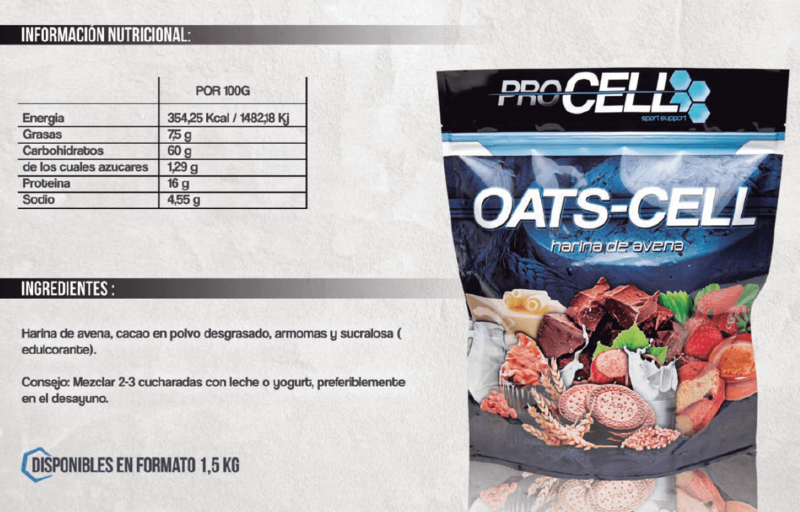 OATS -CELL by PROCELL is the perfect meal for your breakfast. And you can also find it in five delicious flavors: Chocolate cream, caramel (dulce de leche), María biscuits cake, strawberry, custard and white chocolate.